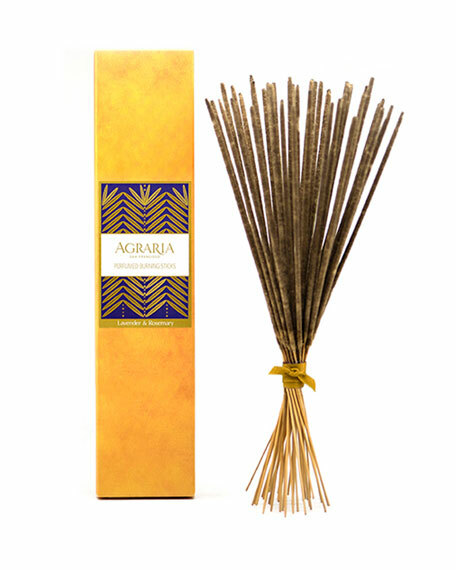 Agraria perfumed burning sticks are infused with the finest botanicals and essential oils from around the world. Set these luxuriously fragrant sticks in your favorite bowl or vase for a chic, lavish display.  A deeply aromatic blend of French lavender, Moroccan rosemary, and whole coriander.  Contains 40 long-lasting incense tapers.  Approximate burn time: 40 minutes each.  Presented in an elegant signature box.